Celery (apium graveolens, Linn. 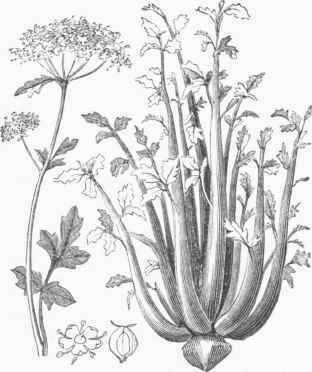 ), an umbelliferous plant chiefly cultivated for salad. In its wild state, in which it is found in ditches throughout Europe, it is rank, coarse, and even poisonous; but by cultivation in gardens it becomes sweet, crisp, juicy, and of an agreeable flavor. Its green leaves, stems, and seeds are used in soups, and the blanched stalks either in that way, or more usually as a salad. One variety, called the celeriac, is raised only for the root or base of the leaves, which becomes a white, solid bull). Celery requires a deep, rich, well drained soil. The seed is sown in a bed, from which the plants are transferred to another when they are 2 or 3 inches high. At 8 or 12 inches' height they are transferred for blanching to trenches which are nearly a foot in depth. The plants are repeatedly earthed up till they have risen two feet or more above the natural surface. Celeriac is not blanched, but grows openly, exposed to the light.